* The nevertheless deserving winner was Haidar Karoum — we HAVE to get to Doi Moi soon, okay, Mrs. Me? And if Tarver King were the monk, he would have achieved enlightenment long ago — instead, we get to experience enlightenment (or close to it) at his current haunt, Potowmack Farm. We followed him there from the Ashby Inn, which is now off the radar since both King and innkeepers Star and Neil Wavra have moved on. And okay, fine, this is all a little over the top. But our dinner at PF was phenomenal — not over the top at all, in fact in some ways quite mellow and restrained. I’m still a little jiggy with it, a couple of weeks later. Took a while to process it all, for review purposes. First, the setting is gorgeous, up a bucolic gravel road amongst the trees just on the Virginia side of the Potomac. You can see a bit of the river from the restaurant, which is sort of a large greenhouse-looking single-room structure, glass and wood everywhere, you feel like you’re out in the wilderness. Someone was playing acoustic guitar across the dining room from our table, at volume perfectly calibrated to provide atmosphere without impeding conversation. I imagine the place can get loud when it is full — the night we ate there, it was only half-full, fairly shocking on a Saturday night but then again it is kind of out of the way and not exactly inexpensive. Service is wonderful, from the hosts to our server, who gave us travel tips in addition to menu tips, to the bartender (cocktail whisperer, really), who explained (sort of) how they created the , more about which below. Farm/restaurant co-owner Beverly Morton Billand dropped by our table to chat not long after we had been seated, even though we’re not anybody in particular, it’s just how they roll. Tarver King did not stop by the table but that’s only because he was busy in the kitchen turning (farm-raised) duct tape and (organic) hubcaps into culinary gold. Bacon can make even an already-good crab croquette better! A selection of “snacks” for the table, a little Zen garden of appetizers, from relatively standard like mini-blini with dill-sour cream, to exotic like spicy fried kimchi pakora (?!). 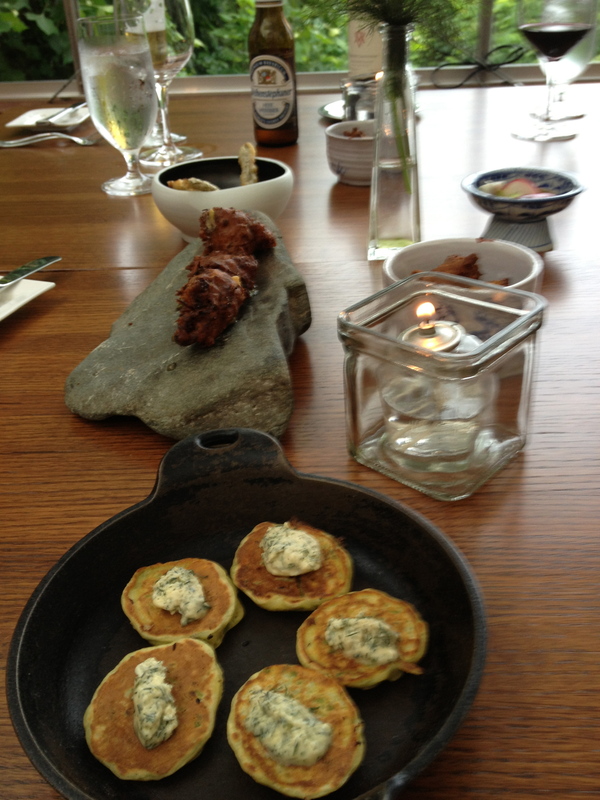 Wonderfully arranged on iron and rock amidst candles — it was like culinary Settlers of Cataan except without the sheep. Delicious. I did the “Found” tasting. Here are some findings. Snapping turtle mulligatawny: no actual turtles in evidence, which was fine, but turtles aside, it was merely a tasty greenish bisque. Crab croquette swathed in a bacon jacket atop black raspberry gel with chamomile leaves: lovely presentation, and very good, but otherwise not especially memorable. 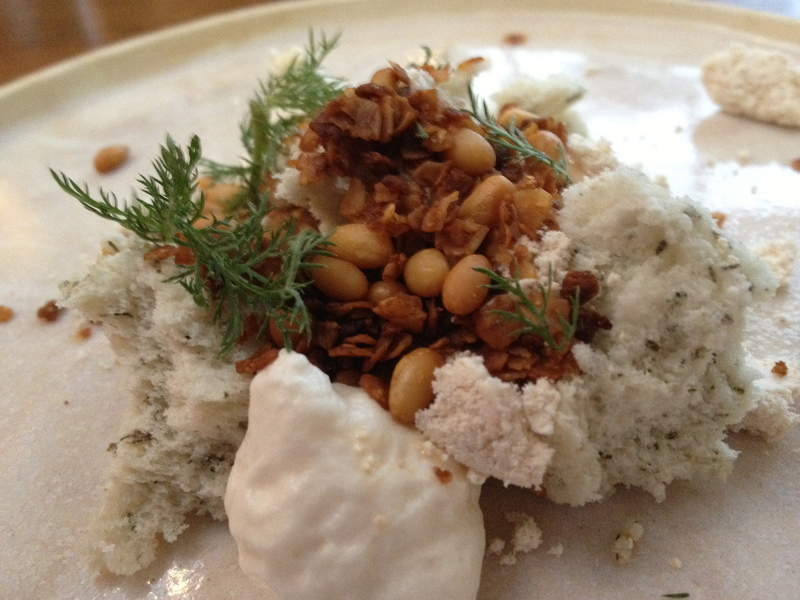 Dessert was “Yarrow Sponge Cake with hickory crew, coriander oats, pine nut powder”: gorgeous to look at in a mossy forest-meets-sea kind of way, this is the kind of thing I imagine them serving at Noma. 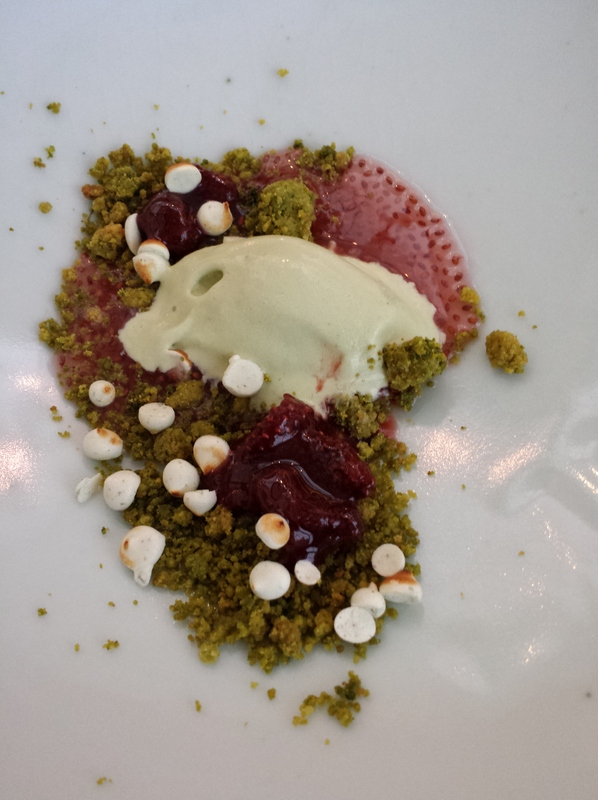 Others went with the “Grown” menu, including roasted escarole (with Surryano ham, grilled onion aioli, nasturtiums), potato gnocchi (with Maitaki mushrooms, sunflower kernels, beef crackling), and chamomile sherbet (with rhubarb, chia seeds, strawberry raisings, lavender). I can’t vouch for the Grown, but people seemed to like it. Here’s the thing about the food at Potowmack Farm, though: it is incredibly inventive, and local, with sublime presentation and service, but the portions are kind of small even in the aggregate (one of my dining companions contrasted the experience with Ashby Inn, where we always left feeling quite full — not quite so here, and in fact another of us ate a yogurt when she got home), and while the food is really good…but there wasn’t one particular dish that was OMGood, like a couple of items at Range. Really, the opening “snacks” were the most exciting course. But then again, it’s amazing that the whole menu changes every night, and CLEARLY further research is needed. As if all that food weren’t enough, the drinks are fabulous too. In particular, a vividly orange-glowing cocktail called Smoke & Fire, made with tequila, lime, honey, and a variety of chilis, some fresh and some maple-smoked. It tasted fresh and earthy, bright and smoky, with just a hint of chili heat. I plan to try to replicate it at home, but I expect the combination and complexity of chilis will be difficult to match. A great drink, one of the best and most interesting I’ve ever had. All in all, very good food, fantastic drinks, spectacular overall experience, I would say worth it even at the price, just not something we can do with much frequency. Although we are already looking forward to next time. It felt daring, ordering the cheapest bottle of wine on the list at Range, whose food you might expect to pair better with rare Burgundies than low-end whatever. Range does offer a fine selection of Burgundies, into $2,500 territory (terroir-tory? ), which is just a teeny bit beyond our budget. The cheapest bottle was a Ken Forrester pinotage, which like all pinotages smells of tobacco, off-putting to many (including, reportedly, the head sommelier at Range, who stocks it anyway). At $18 — how many nice restaurants even offer any bottle for as low as $18? — it had bright, light fruit and a nice finish and was such a bargain we ordered a second bottle (possibly even a third, who can remember? ), to the bemusement of our server. And it paired just fine with the food, which was so good it probably would have paired just fine with three day old tobacco-marinated pond water. Range has been open for maybe 18 months now, and has evidently overcome some mixed early reviews and the immediate, overwhelming crowds to become one of the better restaurants in the area; it would be the best restaurant in Montgomery County if it weren’t on the DC side of Western Avenue, in Friendship Heights. Not sure why it took us this long to eat there. Worth the wait. Service was excellent – both our server and the sommelier were exceedingly friendly and informational, with perfect pacing. We were off in a side room by ourselves (clearly they knew with whom they were dealing? ), so the usual jet-engine-loud dining room wasn’t factor. Mixed Field Greens Salad — a fine salad, with strawberry vinaigrette and candied walnuts and blue cheese, well-balanced, no complaints, disappeared quickly, and yet it was the least exciting thing that hit our table all night. Caesar Salad — apparently this has made some list of the 40 dishes one must eat in DC, and there’s nothing wrong with it, although as an omnivore I can’t agree that any salad could possibly be a top 40 dish. This one was good, but not even the best Caesar salad I’ve had. Also not really a Caesar salad at all, since it involves kale, nor did they prepare it tableside. So, again, a fine salad, but not really noteworthy. Pork Sausage and Rapini Wood Fired Pizza — now we’re getting somewhere. Range does a good pizza, with crisp yeasty crust that remains sturdy even in the middle, and the pork chunks were fresh, unusually pink (looked almost raw but was not), mellow, savory, delicious, and the rapini provided a slightly bitter counterpoint. Not the best pizza in town, but very good. Baker’s Basket — a mix of four breads, most crucially the cheddar-jalapeno biscuits and cheddar cornbread. Those were both great, but even better for the spreads that came with them, slightly spicy pepper jelly and smoky bacon marmalade, respectively. The “jelly” was really more of a marmalade and the bacon was almost a pate, and I nearly asked for a bowl full of it, which I would have eaten happily with a spoon. Grilled Pork Tenderloin with Succotash — we ordered the “pork duo” special and this was half of it, with perfectly pink sliced pork on a bed of tiny whole onions, lima beans, corn, that kind of thing. Succotash is not normally my thing but this was very good. Also did I mention there was grilled pork loin? Just not enough of it — that’s the only complaint I can think of. Fried Brussels Sprouts — BS have become the cupcake of upscale restaurant vegetables, i.e. ubiquitous and often disappointing. But Range does them as well as my current favorite Brasserie Beck, but different: larger sprouts, fried not roasted, and in a fish sauce/lime sauce that infuses the burnt-crisp sprouts with all kinds of umamified deliciousness. Also, Range achieves their Brussels sprouts heights without the aid of bacon, so they get extra points for degree of difficulty. I could have kept eating these crunchy-edged salty-savory nuggets all night. At most dinners, this dish would have been the clear #1 highlight — but not at this dinner. Pork Belly with Creamy Grits and Crisp Pork Rind — the other half of the pork duo, this small tower of flavor power is one of the best things I have eaten lately, right up there with a couple of Potowmack Farm dishes (PF review coming very very soon, seriously). I guess they roasted the pork belly, I’m not sure, it was sort of caramelized, dark brown outside and still pink inside, and tender to the point of collapse at first fork contact — if the Martians collapse so easily someday, we will be in great shape. The grits were indeed creamy, and sweet, and delicious in their own right although I’m sure being soaked in pork belly juices didn’t hurt much. The pork rind was indeed crisp, although someone else ate that. It was a small portion and we all shared a bite or two, but again I could have ordered a dozen more and eaten them all myself. 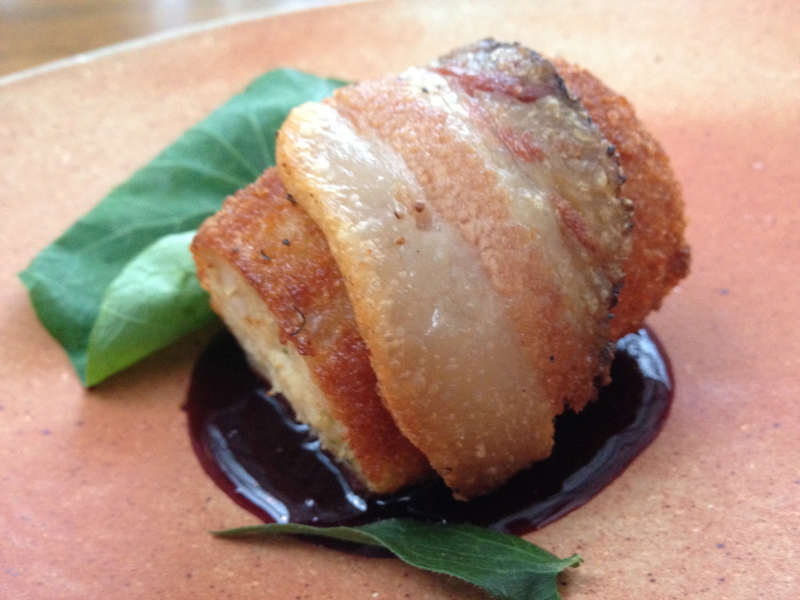 A great combination of textures and flavors, executed perfectly. So, a nice time was had by all. No photographic evidence of the meal, alas. I would also note that while Range is a (celebrity chef) Bryan Voltaggio restaurant, they keep the merchandising to a minimum, offering signed copies of his book, VoltInk, but that’s about it, a nice difference from some other celebrity chef restaurants I can think of (*cough* Bobby Flay *cough*). We recently dined at Equinox (818 Connecticut) and Bobby Van’s Steakhouse (809 15th Street NW) on back-to-back Friday nights. Bottom lines: Equinox was excellent, BV’s was fine but not worth the price. But we were most struck by the half-empty dining rooms in both restaurants, on a Friday night, around 7pm. To paraphrase Babu: where were all the people? Show me people! There are no people! Our theory is probably obvious: the DC restaurant scene has exploded in recent years, competition is fierce, and elegance is out, hip is in. While Equinox continues to serve some of the best food in DC, it is certainly not hip. You know that every 14th street spot is packed every Friday night — not just that strip, but that’s the one that comes most to mind these days. Tom Sietsema, in his recent review of Joe’s Seafood, Prime Steak & Stone Crab (also not exactly hip? ), noted it was full on a Monday night, and wondered if nearby restaurants were worried about the competition. Bobby Van’s is nearby, and so I would say yes, they must be worried. Quick recap of our Bobby Van’s experience: good but overly formal service, high prices, okay food. Avoid the house steak sauce, which is more like sweet and sour sauce and does not enhance the gristly but otherwise perfectly cooked, reasonably tasty New York strip. Fries are pretty good. Overall though the steak and fries are not any better than at Medium Rare, and lack the awesome MR sauce, and are twice as expensive for a comparable portion (fewer fries at BV, actually). Longer recap of Equinox. Ten years ago, Equinox — or as they sometimes like to call it “Chef Todd Gray’s Equinox Restaurant” — was on essentially every critic’s list of the top restaurants in DC. It seems like that’s not the case anymore — as noted we were surprised to find it barely half full on a Friday night — but the kitchen still creates delicious food, service is top notch, and the decor is still elegant, maybe a little outdated, but whatever. And you can hear yourselves converse, which is a nice change from a lot of restaurants. But for whatever reason, the millennials don’t seem to be eating at Equinox, at least they weren’t when we ate there last week, aside from maybe the dude sitting at a front table wearing a black t-shirt that said “Han Shot First” — a sentiment with which I completely agree, but maybe not in an upscale restaurant. Equinox isn’t exactly the Mos Eisley cantina. Then again, I’m not a paragon of fashion myself. Back to DC, back to dinner. Pacing was a little slow, but it was fine, I think the servers actually did a good job reading our conversational flow. We were clearly in no hurry. From the amuse bouche — duck confit egg rolls — to dessert — okay poached pear and glorious chocolate panna cotta — we ate well and had a great time. Beer-braised lamb shank required no knife, falling apart and away from the bone at the slighted touch. Sous-vide short rib and beef loin were incredibly tender and rich. Our server was pushing the fish — actually he was pushing everything on the menu equally, really my only complaint, it’s nice to get an actual preference/recommendation — and the fish-eaters among us were pleased with their Texas Red Fish and Norwegian Salmon. The monkfish apparently knows no state or country and maybe that’s why nobody ordered it. We also tried the truffled mac & cheese, which was not discernibly truffled but otherwise fine, as it is in most restaurants. It’s hard to make a transcendent mac & cheese, but fortunately fine is just fine as long as you don’t expect more. Dessert came with a little shot of prosecco on the house, which was a nice complement to the pear dish in particular, but it was the rich, creamy “Mocha Moderne” panna cotta that ultimately won the night. It’s almost enough to make me crave chocolate. Does anyone make a lamb shank panna cotta? Entrees are in the $26-34 range, reasonable for that level of quality food and service. I’d happily go back, although the location just south of Farragut Square isn’t convenient for us. Also, the restaurant isn’t much to look at from the street, I suspect that may improve once warmer weather hits (not this week!) and they can open the front patio, but possibly the lack of curb appeal hurts the winter dining scene. On a brighter, more seasonal note than the previous post, both Nava and Ruan are listed in the Washingtonian “100 Very Best Restaurants issue” arriving in today’s mail — not yet available online I think. This is not the best cheap restaurants issue, this is the best of the best, led by Inn at Little Washington and Minibar and Komi — so kudos (yet again) and happy new year to Wheaton’s pair of great Thai spots. Of course, the list is not without its missteps, like Central Michel Richard in the top ten (for me, mediocre and thus extremely overpriced on two 2013 lunch visits) and Jaleo at #15, nothing wrong with Jaleo but shouldn’t be remotely that high on the list. Overall, though, a fine collection, reminding me as usual that I need to eat out more… Only the top 25 are ranked, and Nava and Ruan are in the remaining 75 somewhere. Perfectly reasonable. Bereft of my own content — washed clean away with a week of rain — I refer you to WaPo food critic Tom Sietsema’s “Ten Great Tastes for $10 or Less” of which Wheatonian Ruan Thai’s Yum Watercress is #1. Mrs. Me does not love the watercress so we rarely order this, but I am with Sietsema, it is totally Yum. His Fall Dining Guide is also out, no Wheaton spots on the list, surprise surprise, but hard to quibble with most of the choices. DC restaurant quality is high these days. I have been to, and agree with the inclusion of, Bourbon Steak, Del Campo, Etto, Ghibellina, Oyamel, Palena, Rasika, and Vermillion. The only place on his list I wouldn’t include is Jaleo, which is fine but not Top 40 — I might replace it with Mourayo, but there are plenty of contenders. Places on the list I have never been but are high on my list of places I want to go: Blue Duck, Doi Moi, Izakaya Seki, Komi, Le Diplomate, Woodberry Kitchen, and especially Little Serow. Hadn’t been to Central Michel Richard for a few years, but hit it for lunch with colleagues the other day. It’s a nice place, but not quite as delicious as I remember from before. In particular, the Brussels sprouts disappointed me: the smallish, washed-out sprouts were soggy, as was the accompanying bacon; overall the dish is nowhere near Brasserie Beck-quality. Not bad, but mediocre. Bacon and onion tart was only okay. Lesson: at Central, stick to the sandwiches (specifically hamburger, lobster burger, and meatball sandwich, all come with the crunchy fried onion disc) and the excellent fries. Probably also the fried chicken, which I still haven’t had but need to get via the lunch bucket takeout special one of these busy workdays. It would be easy to make jokes about lobbyists eating at Kensington’s K Town Bistro (3784 Howard) but those jokes would not be funny, not least because I don’t think many lobbyists are in the habit of dining in Kensington, plus it is K Town not K Street. And if it were a terrible restaurant, the strikeout headlines would write themselves. I love headlines that write themselves — but this one just won’t. K is for kookie? Kooky? No and no. I’ll just have to move on. In any case, K Town isn’t terrible — in fact, overall it is quite good, straddling a line between fancy restaurant and eclectic bistro, and certainly is more elegant than any Wheaton restaurant. The service is excellent, not surprising since owner Gonzalo Barba has been running high end restaurants (including at the Watergate Hotel) for decades. Gonzalo himself was working the room like a pro all evening, helping deliver and clear dishes, explaining and rectifying occasional glitches, definitely a strong presence. The art on the walls is…interesting (some is for sale), and the orange-yellow pastel walls themselves seem salvaged from dear departed Suporn Thai (but they aren’t really) (I assume…). I don’t mean that as a criticism; the sum is greater than the parts here. The kitchen’s plating demonstrates artistry and lots of planning: almost all the dishes look great. The physical dishes themselves are interesting, often mismatched in ways that work — dinner plates don’t necessarily seem to match salad plates, or soup bowls, or glasses, but it all comes together. Only the French onion soup isn’t visually inviting: for some reason the chef chooses to merely float a cheesy crouton within the confines of the bowl’s rim, not even close to spilling over the top, which is how the best examples of the genre get their delicious (and attractive) blistered crust. Still, the soup was reportedly good, as was the lobster bisque, which I can vouch for myself and, as advertised, tasted of lobster and sherry. Fried oysters with saffron aioli atop avocado mousse is not a combination I ever would have come up with, but I really liked it; the fry job was solid, the bivalves were crisp and briny, and the aioli and avocado were delicious. Unexpected, but it works — seems to be a theme at K Town. What else was good? Most everything we tried: gnocchi in a surprisingly liquid sauce; rich, fork-tender braised short ribs with a small tower of cheesy zucchini that I devoured in about three seconds (but also some gummy, bland risotto); and a cute single serving beef Wellington that I didn’t taste so can’t really comment except that it disappeared quickly and the golden-brown pastry looked perfect. We don’t usually have dessert but did this time: vanilla ice cream was creamy but nothing special; creme brulee was also creamy, rich, crunchy on top, very good. There were a couple of snafus with the wine: they hadn’t updated their list so what we thought would be a 2009 malbec turned out to be a 2010, and then after an offer of a bit of sauternes to go with the (excellent) fois gras, it turned out they were in fact out of sauternes* — the replacement muscat was (reportedly) fine but, well, not sauternes. * This reminds me of Monty Python’s Cheese Shop sketch (one of their best ever), in which many cheese options are not available — in fact, the shop harbors no cheese at all — but the Camembert is at one point offered and subsequently the offer is retracted: “oh…the cat’s eaten it.” I, too, delight in all manifestations of the Terpsichorean muse. We liked the service and ambience and, mostly, the food, and we will certainly return in the future to explore more of the menu; I don’t know if I would call this a “special occasion” restaurant, and the atmosphere is different from, say, Mrs. K’s or the Black Market Bistro, just to name a couple of other local, relatively-fine-dining establishments in the same price range (K Town appetizers $7-15, entrees $20-30) and probably it depends on personal taste where one might choose to dine. It could be a special occasion restaurant, and at least it is nice to have a good, relatively upscale “American” food place to go in the Wheaton-Kensington area.